Click here for a detailed guide and images. All cards are limited to 99 or less. SP cards - 25 or less, SSP cards - 10 or less. Serial Numbered #/99. Click here for a detailed guide and images. The combined print run on the Elite Aspirations and Status totals 100. The Status are numbered from 1 to the player's jersey number. The Aspirations are numbered from the player's jersey number to 100. While it's easy to drool over the double-rookie class of 2013-14 hockey card products, 2012-13 releases have rookie cards too. The crop might not be as deep, but there are still several standouts. 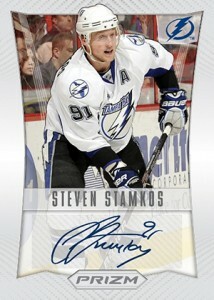 2012-13 Panini Rookie Anthology Hockey goes heavy on the rookie content, combining designs from several brands. It also includes the first Panini Prizm hockey cards. 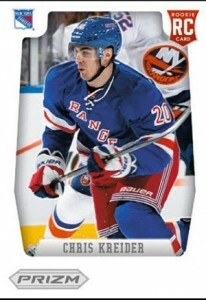 2012-13 Panini Rookie Anthology Hockey has a standalone 100-card base set. From there, rookie cards and inserts stem from a handful of Panini brands like Contenders, Crown Royale, Elite, Luxury Suite and Titanium. This means that rookies have multiple cards throughout the product. Every 2012-13 Panini Rookie Anthology Hockey hobby box comes with a total of four autographs and memorabilia cards. Rookies are front and center in a handful of familiar inserts and subsets. Rookie Treasures, numbered to 99 or less, come with an autograph and a pair of memorabilia swatches. Inscriptions Autographs are printed on acetate. Titanium Rookies comes numbered to the player's jersey number. Available for both rookies and veterans, Crown Royale Silhouettes return with a die-cut player image placed over top of a large jersey piece. Numbered to 99 or less, they also come signed. More high-end memorabilia and ink come from the Crown Royale Lords of the NHL Patches and Luxury Suite Memorabilia Autographs. Each hobby box also has a three-card Prizm Hockey pack included as a box topper. The Prizm set has 52 veteran cards and 48 rookies. Parallels come in the form of Rainbow, Red (#/50), Blue (#/25) and Gold (#/10). Great Varity, quality and value. Ase cards were plain, not many inserts.. But the hits kept on coming! As soon as I opened the prism bonus pack, I knew I was in for a pretty good experience.. The prizm bonus had the SSP Carey Price auto! Right then and there, that was my moneys worth! Definitely my best hockey hit so far.. It followed with 6 other hits for a total of 7 hits! I got a rookie patch auto of Jake Allen, Carl Haglin inscriptions, Brent Burns Towering Defenders, Jaroslav Halak Silhouettes, and two Game Worn Gear Scott Hartnell and Evgeni Dadonov patch.. These boxes are loaded! 2012 13 PANINI ROOKIE ANTHOLOGY HOCKEY HOBBY BOX 4 AUTOS MEMS PER BOX!